This post also brings up a fun story about my Betty Crocker cookbook. When I was growing up, mom had her 1970s bright-orange edition of the Betty Crocker cookbook, and that was practically all we would ever use when it came to baking. In fact, my favorite chocolate cake recipe comes from this book. One of the first times I went over to my hubby’s house, I saw the exact same bright orange cookbook on his bookshelf! It was then, at that very moment, that I knew he was the one. . . So back to the cookies! I thought this was an interesting recipe because it uses shortening instead of butter, and it uses no eggs. I tweaked the spices to my tastes and here is what I came up with! Cream butter and sugar. Blend in molasses, water, flour, salt, baking soda, ginger, nutmeg and allspice. Cover; chill 2 to 3 hours. Heat oven to 375F. Roll dough 1/4 inch thick on lightly floured surface. 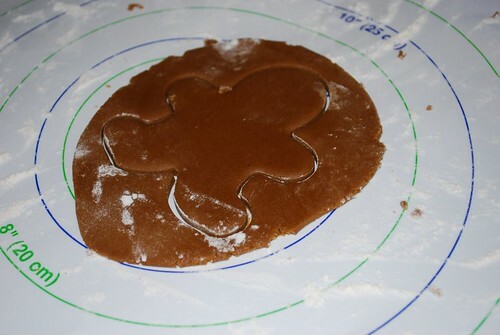 Cut with cookie cutter; place on ungreased baking sheet. Decorate with raisins, red hots, or other candies (make sure you pick candies that won’t melt!). Bake 8 to 10 minutes. Immediately remove from baking sheet. Cool on racks. Decorate with icing as desired, and enjoy! It’s wonderful to see this book again. My Aunt Ellen Newton who was in her 70’s at the time, bought this book for me along with a deep fryer when I was in the 6th grade, 1970/71. I loved buying french fries at the neighborhood carryout after school. So she bought me this book and said “now, you can fix them for yourself anytime you want.” I cherished that book, and I made my first brownies from it and learned how to make my french fries and used the deep Fryer to cook them. Unfortunately, I lost my book along with a few other recipes between the pages and the deep fryer in 2008 when I lost my property at a personal storage company. Just seeing a picture of the RED Betty C. cookbook with the pie sections on the front brought back so many memories. My Aunt inspired me to cook at an early age. Some of my favorites were spaghetti and meat balls, Ham, macaroni & cheese, pumpkin pie to name a few. I also prepared my first meals for my husband using that Red Betty Crocker cookbook. My cousin didn’t believe I cooked it. I will always cherish her memory. That old worn Red book and deep fryer were very special to me. I would love to have another one with the same recipes on the same pages.